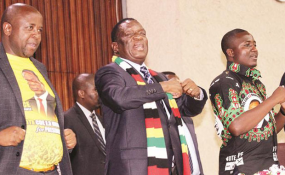 President Emmerson Mnangagwa, National Youth Chairperson Pupurai Togarepi and Zanu-PF secretary for youth Lewis Matutu (file photo). Zanu — PF has commended Government for introducing mass public transport to alleviate the plight of commuters and coming up with corrective measures to guarantee the safety of all Zimbabweans. The mass public transport system came into effect yesterday. The party said the measures show Government's commitment to ensuring an improvement in the national economy and the general livelihoods of the people. Addressing journalists yesterday, Zanu-PF Secretary for Information and Publicity Ambassador Simon Khaya Moyo said Government should accelerate refinement and operationalisation of the National Public Transport Policy to ensure a more permanent solution to the challenges affecting the public transport system. He said the party condemned the unlawful events which took place last week and resulted in the loss of life and destruction of property. He said the unlawful events were in contravention of the Constitution as many people were obstructed from peacefully conducting their daily activities as roads were barricaded and businesses and other national institutions such as schools were forced to shut down. "While Zanu-PF continues condemning in the strongest terms such barbaric acts of terror, it is pleased to note that Government has instituted corrective measures to guarantee the security of all citizens as enshrined in the Constitution. "The party commends Government in its efforts towards alleviating the plight of the citizenry through interventions such as the introduction of the new mass public transport system. The party is also aware of the efforts being taken by the Government to alleviate the current dire fuel situation in the country," he said. Ambassador Khaya Moyo expressed concern that some known MDC Alliance activists masquerading as human rights lawyers would want to mislead the people of Zimbabwe by creating a false impression that acts of terrorism such as destruction of property and killing of innocent people are rights conferred under the national Constitution. "The party calls on the media to report objectively fully knowing that it is their constitutional duty to act in the national interest. We thank Zimbabweans for remaining calm in these tempting moments. We urge them to remain peaceful and give Government time to address the challenges," he said. He dismissed allegations that the disturbances were a result of the factionalism in the party and said he was not aware of any divisions.